Citroen has revealed pictures of its facelifted C3 hatchback, which is premiere at the 2013 Geneva Motor Show. The most obvious changes are at the front of the car, which gets a light restyle with new grille and bumpers. The tail lights have been lightly restyled, too. A new colour - Ink blue – is available, as are new upholstery styles and interior trims, including dashboard strips in matte black, warm brown and ‘Moondust’ grey. New equipment includes a reversing camera, new sat nav system and a ‘connecting box’ with Bluetooth, Aux and USB connectivity. Perhaps the most important changes are under the bonnet. New 1.0-litre and 1.2-litre three cylinder engines improve fuel economy by around 25% over the older four-cylinder engines. The most efficient of the two – the 1.0 VTi – produces 68PS and has emissions of 99g/km. A four-cylinder petrol is still offered – the VTi 120 – and there’s a quartet of diesel engines with power outputs from 70PS to 115PS, the most cleanest of which emits a competitive 87g/km of CO2. 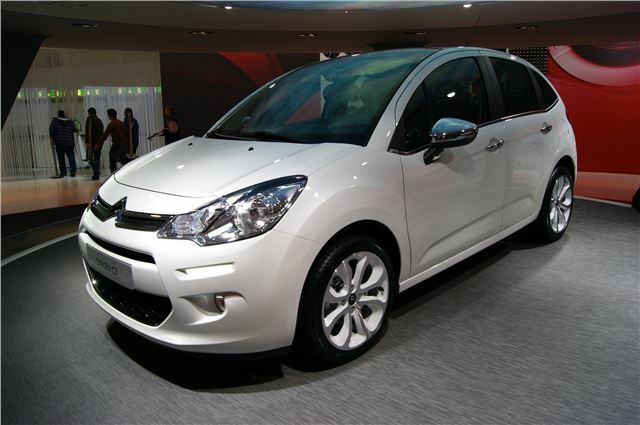 The facelifted C3 is due to go on sale in the UK this Summer, and should be around the same price as the outgoing model.